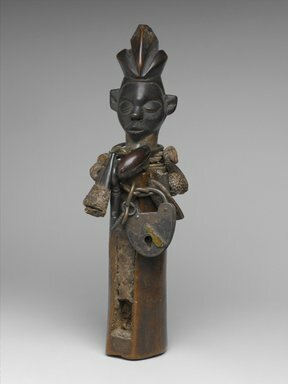 Hardwood figure in shape of a slit gong surmounted by a head. Hung with heavy wire and rope necklaces, on which are old European keys and padlock, bird beaks, seed pods and other material. Medicine packed in top of tri-crested headdress and slit in front of body. "Slit-drum".